The native of Reading, Pennsylvania, joined the St. Louis Cardinals at the end of the 1941 season, remaining with the team through 1948 as a stellar third baseman until an arm injury prematurely ended his career. Kurowski batted .300 or better his last three full seasons. He also hit 20 or more homers in three seasons. Kurowski played in the 1942, 1943, 1944 and 1946 World Series. He was the hero of the ’42 Series: tripling in the second game to give the Cards a 3-0 lead, scoring the winning run in Game 3, driving in two runs in a six-run rally leading to a Cards’ victory in Game 4, and slamming a ninth inning, three-run homer in the fifth game that won the world championship for the Cards over the New York Yankees. “Whitey Kurowski for President!” That was the cry around Reading, Pennsylvania, that first weekend in October 1942. It was not a presidential year, but the people of Reading were ecstatic. Whitey was the first Reading product ever to be in a World Series, and he did himself proud! He tripled in the second game to give the St. Louis Cardinals a 3-0 lead over the New York Yankees. He scored the winning run in the third game as the Cards won 2-0. In the fourth game he drove in the first two runs in a six-run inning that led to a 9-6 win. He saved the best for last. The Cards were leading the Series, three games to one, and the score was tied when he came to bat. In the ninth inning of the fifth game, Walker Cooper opened with a single and went to second on a sacrifice, and Whitey came to the plate. Red Ruffing was on the mound for the Yankees. He had struck Whitey out three times in the first game when he held the Cards hitless for seven innings. Not this time, however. With the count 1 and 1, Whitey drove the ball into the distant stands, winning the game and the Cardinals were champions of the world. The Yankees had been heavy favorites to win the Series. They had won in five of the last six years. They won the first game in 1942, but St. Louis, thanks mainly to Whitey’s hitting, swept the next four. Johnny Beazley and Ernie White both pitched great games for the Redbirds- White shutting out the Yankees in the third game with six hits, marking the first time the Yankees had been shut out in World Series competition since another Cardinal, Jesse Haines, had done the trick in 1926. 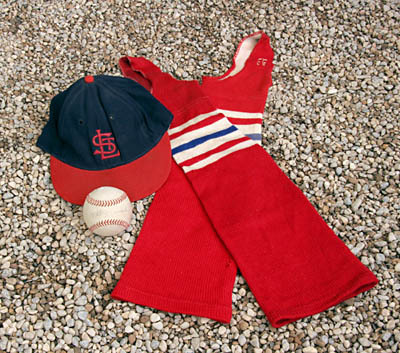 Whitey, who was born and raised in Reading, had come up to the Cardinals at the tail end of the season in 1941. His first full season was 1942, and he hit .254 in 115 games. He was their regular third baseman through the 1948 season, three times hitting over .300. He also hit 20 home runs or more three times. He played in three more World Series with St. Louis in 1943, 1944 and 1946, and hit well in each. His lifetime batting average was .286 for the regular season and .253 for World Series play. That Whitey ever played baseball at all is another story. When he was eight years old he fell off a fence, landing in some broken glass and gashing his arm above the wrist. Two years later when the arm became sore and swollen, they found an acute case of osteomylitis. Some of the bone had rotted away and three inches of the bone had to be cut away. Dr. Robert Hyland, renowned physician of the Cardinals, said it was a miracle he could throw at all. He became a major leaguer through sheer will and determination. It undoubtedly was the most unusual arm of any player who ever played in the big leagues. It took great courage and determination to reach the height that Kurowski did.